It’s time for that seasonal staple known as the holiday letter, a tradition that, as a recipient, fills me with a mixture of dread and delight. Although I enjoy reading what people have been up to in the last year and looking at photos of their charming families, I lament the trend toward filling these missives with accomplishments and acquisitions – especially considering that Christmas is about the birth of a babe to poor folk in a humble setting. With the onset of social media and the expansion of Christmas cards into one-size-fits-all letters, it seems we’ve reached a new level in what used to be decried as bragging. In glorious, illustrated accounts of our good fortune, some of us seize on Christmas as an opportunity to detail trip itineraries, house plans, and job promotions, all with seemingly little awareness of those on our mailing lists who may be struggling with illness, death, economic hardship, and other woes. I know that we are to rejoice with those who rejoice and weep with those who weep, but when you’re busy rejoicing in print over your own fortuitous circumstances, can you really hear someone weeping? And, although those who weep are often gracious enough to be glad for the blessings in another’s life, do we need to push them to the limits by going overboard with our good news? I have also noticed that in letters from some people who have real struggles, their concerns are either barely acknowledged or strangely absent. For example, I got a letter one year in which a short notice of a family member’s passing was sandwiched between triumphant paragraphs about high-achieving children, pets, and a second home. In another instance, I once asked a friend why she wasn’t sharing something of her difficulties with her aging parents in her annual letter and she said she didn’t think people wanted to read that sort of news over the holidays. But what if leaving such things out gives the impression that our lives are perfect, creating distance between us and those we call friends? Do we really want people to think we lead lives in which the most agonizing decision of the year was whether to buy Viking or Sub-Zero appliances for the new gourmet kitchen, or the most taxing challenge was coordinating flights to multiple destinations so as to maximize air miles? It is good, after all, to know not just the happy occurrences, but the sorrowful ones, too. By this, I don’t mean that we should report every detail of a surgery or send out screeds of anguish, but that we give people an honest, balanced picture of our lives. 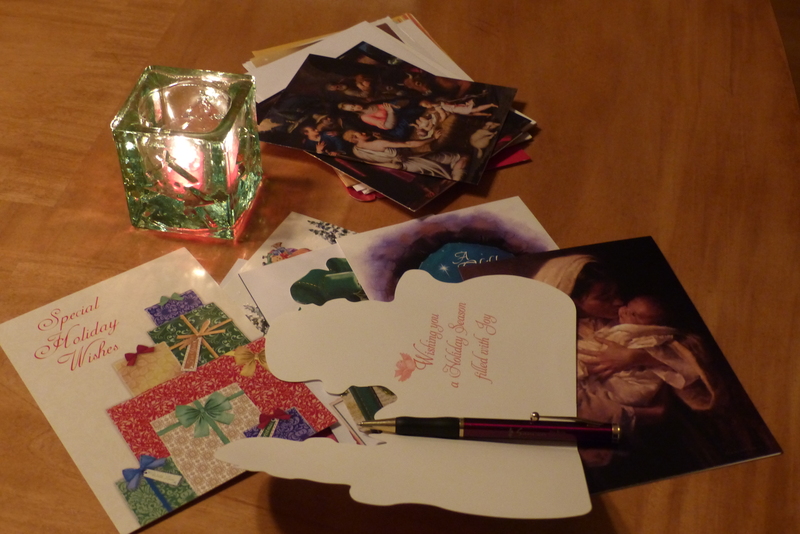 As an antidote to some of the excess in holiday letters, I’ve tried different tacks over the years, such as writing short notes in my cards or, if a letter is appropriate, personalizing it and toning down good news, acknowledging losses, and writing about nature. I’ve noted and appreciated those friends who have chosen similar alternatives like sending poems they have written or, as one has done this year, excerpts from a sermon he first preached in December, 1986. For last year’s letter, I simply shared a reflection I had written for the funeral service of my Aunt Anna, who had died just before the holidays. I thought her quiet life had something to teach all of us, especially at this time of year.